The change of seasons we no may be a lovely thing but not so much with respect to your chimney stacks water repelling ability. The heat of the summer and also the cold weather of the winter months can take their toll on your chimneys flashing to retain the ability to reflect the water from your home. We frequently find most chimneys that leak will need to have updated higher quality flashing attached and this consists of removing the old roof shingles circling the chimney and all of the existing flashing and install an all new and up do date flashing so as soon as that's added we caulk all the locations which need it and after that replace the shingles surrounding the chimney. Once this is carried out by our roof leak expert the chimney will definitely possess the ability to repel any water that is presented on the roof covering around the chimney. 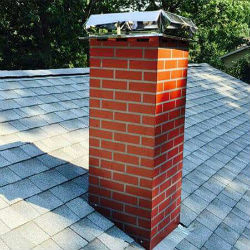 If ever you discover you have a chimney leak simply give us a call today and let our roof leak repair experts evaluate your particular chimney flashing and or sealing requirements.